Once you have added all the details for an event you are creating, one of the final steps is to add shifts. You must set a Timezone before you can add a shift. Then click "Add Times". Note* Even if your event is for one timeslot, you have set the time and date with the Frequency set to Once, you must select "Add Time"
If you are creating a recurring event, you can set the frequency as Daily, Weekly, or Monthly and set a range for when you would like this recurring event continue happening. When you click "Add Time" it will automatically add shifts for each of the daily, weekly, or monthly recurrences that you have set. 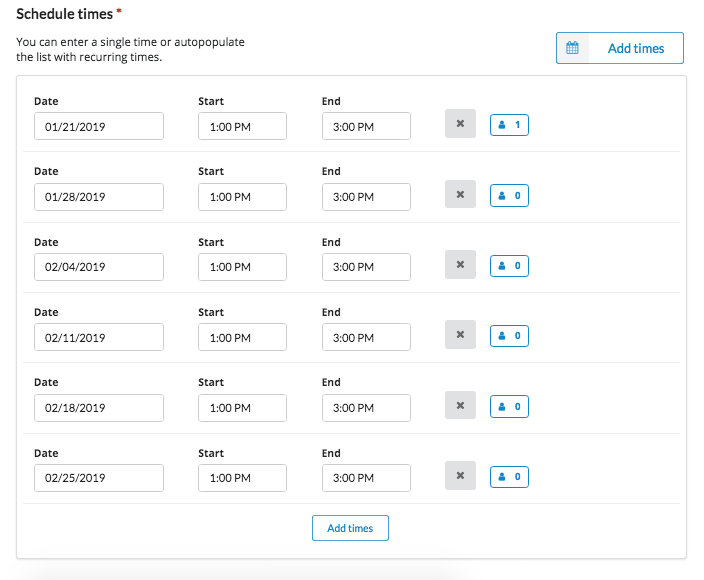 Below you can see the shifts that result when you click "Add Time" with the forms filled in as shown below.